Zogby: Obama can "take on the big issue with the big speech -- and deliver"
Aslan: "He will give the usual platitudes about the Middle East"
Wexler: "This is not a free lunch for the Arab world"
(CNN) -- President Obama went to Notre Dame, a Catholic university, to do the abortion speech, and to the National Archives to do the Guantanamo speech, so James Zogby hopes when Obama gets to Cairo, Egypt, on Thursday, he'll do the Middle East speech. Mideast experts differ on the approach President Obama should take in his Cairo speech. Obama's successes in previous major addresses on subjects such as race serve only to raise expectations for this one, said Zogby, the president of the Arab American Institute in Washington. "He has defined himself with his tendency to take on the big issue with the big speech -- and deliver," he said. What Zogby wants Obama to deliver in Cairo is nothing less than a breakthrough in the Arab-Israeli conflict, he said. "In Egypt almost 60 percent of people say the most critical issue facing their country is the Arab-Israeli peace process," Zogby said. He urged Obama not to speak in generalities. The speech "ought not be, 'We are not at war with Islam.' It has to be substantive and significant. It's not a question of soaring rhetoric, it's a question of digging down deep into the details," he said. Four members of his family were killed by the Israeli army. Christiane Amanpour reports on a Palestinian doctor's "Battle for Peace." "The issue they want to hear about in Egypt and the immediate area is: 'What can you do with the Arab-Israeli thing?' "
That the speech comes quick on the heels of White House meetings with King Abdullah of Jordan, Prime Minister Benjamin Netanyahu of Israel, and Palestinian Authority President Mahmoud Abbas only builds expectations for Obama, Zogby said, especially given the perception that Obama was tougher on Netanyahu than earlier American presidents have been on Israeli prime ministers. But Malcolm Hoenlein, a top American Jewish leader, dismissed the suggestion that Obama was coming to the Middle East with a solution in his pocket to problems stretching back decades. "They know very well that does not work," said Hoenlein, the executive vice president of the Conference of Presidents of Major American Jewish Organizations. For a plan to make a difference, "it has to be meaningful, and to last, it has to be organic and come from the region. He is not going to get into a detailed plan, and it would be a mistake for him to do so. "Any attempt to impose a solution fails," he argued, and on top of that, "There is very little new to be proposed." The timing of Obama's speech also makes it unlikely he will unveil a peace plan, Hoenlein said. "You have Lebanese elections this week, you have Iranian elections next week, you have [the Palestinian factions] Hamas and Fatah shooting it out -- and that's all without Israel," he said. Hoenlein rejected the idea that the Palestinian problem is the Arabs' greatest concern. "For most of them, Iran is really the critical issue of the day. People pay lip service to the Palestinian issue, and they mean it, but the real issue is Iran," he said. Reza Aslan, author of "No God But God," a best-selling book about Islam, has very low expectations for Obama's speech. 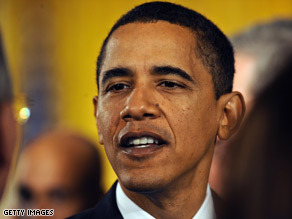 He wants Obama to confront the lack of democracy in the Arab world. "Every single poll that has ever been done, not just of the Middle East but the Muslim world, has said that the No. 1 issue for Muslims around the world is the lack of political and social rights," Aslan said. "If he is going to stand in Cairo and not address American support for Muslim dictators, the Muslim world will turn away from him. "He is going to have to say this," Aslan said, "in the face of his host," President Hosni Mubarak of Egypt, who has been in power for nearly three decades. "Is he the kind of man to do this? Yes. Will he actually do it? Unlikely." He also thinks it unlikely Obama will push for a game-changer in the Israeli-Palestinian impasse, though Aslan describes the conflict as "a universal symbol that binds the Muslim world from Islamabad to Detroit." "He can't just call for a Palestinian state," Aslan said, pointing out there is nothing new in doing so. "So what? He can't just call for the [Israeli] settlements to be stopped -- the [Israeli] government has said no." Even if there were something new to say about the conflict, Aslan said, "There is no way he is going to make that speech in Cairo -- the political ramifications in the U.S. will be so great." U.S. Rep. Robert Wexler, a Florida Democrat who is Jewish and close to Obama, disagreed. "This president has highlighted the need for the Israeli government to take serious action on settlements," Wexler said, citing Obama's tough words to Netanyahu in Washington last month. "He has already proven himself serious about his role in the Middle East peace effort -- and what needs to happen now is that Prime Minister Netanyahu needs to respond in a serious fashion," Wexler said. But, he said, "This is not a free lunch for the Arab world. Arab leaders have a responsibility as well. If Netanyahu responds, the Arab world has to begin the process of normalization" with Israel, which most Arab states have never formally recognized. "I think he can satisfy all sides because the policy that the president is advocating is in the security interests of the United States, Israel and the Arab world. This is not a zero-sum game. The president's policy is a win-win for people of the Muslim faith and the Jewish faith." The key effect of the speech may not be tangible, Wexler said. "The most important consequence of the speech will be that America's position vis-a-vis the Arab world and the Muslim world will be significantly enhanced," he said, because of "the effort that President Obama is making to reach out in partnership and trust." Aslan isn't sure about that, but he's not willing to bet against the president on the eve of the speech. "I have learned never to doubt Barack Obama," he said. "Every single time it has been predicted that he will step away from the controversy, he steps into the controversy. I hope he will prove his critics wrong."